Good footwear is necessary for all of the routes.In most situations strong shoes or trainers will suffice.When wet, however, summer walking boots are recommended, particularly for the longer routes, and those that involve some rock scrambling. This high level easy route starts at the roadside just opposite the back entrance to the Athena Palace Hotel at Elia Beach.It is an easy woodland walk along forest roads and narrow tracks, which give fine views of the coastline and beyond.The walk visits the church to Paul the Apostle on the hill above Elia Beach and also Petros, the very large rock, with a trig point on its summit, which pokes up through the trees. This is the highest point on the ridge and those with a good head for heights can ascend the rock to enjoy the excellent views over the peninsula. The path starts at the track, which leads into an olive grove almost directly opposite to the rear entrance of the Athena Pallas Hotel. The track runs in a southeasterly direction along the edge of the olive grove for about 300m when a track junction is reached.Take the lower track, which passes an electical sub Station as it meanders along but it still continues in the same general direction. In 400m or so a shallow valley to the right gradually gets deeper and the route begins to climb more steeply through the trees in a series of short zigzags.As the broad summit of the ridge is reached, the path turns more to the north and the woodland thins, thus providing fine views over the coast. Four hundred meters of gentle ascent along this broad ridge bring the walker to Ag.Pavlos,with its holly well. The land on this plateau is like a giant rock garden as massive rocks are interspersed with pine trees,flowering shrubs, heathers, and other plants.It is beautiful at any time of the year , but even more so in the spring.Like many other walks in the area, many of the forest tracks are lined with beehives and there is often the sweet smell of honey in the air. To continue on to visit Petros, take the sandy track that leads almost due east from the church (look for the way-markers).Four hundred metres along this track look out for a Poseidon way marker on a tree to the right of the track.This marks the Start of a narrow woodland path that will take us directly to Petros.To route winds through the trees and there are many tracks, due to the herds of goats that graze in these woods. To avoid getting lost,look for the Poseidon way markers on the trees.The track meanders on in a southeasterly direction for a distance of 300m to arrive at an open grassy Clearing in the woods surrounded by large rocks. This is a good place to take a coffee break.The rocks in this area and the sand in the road sparkle a lot when seen in the sunshine.This is due to the presence of the mineral mica in the rocks,which is used in industry as an electrical insulator.The path now continues, through mainly open woodland , to the southeast .In 400m we emerge onto a track immediately to the north of Petros, although th rock itself is hidden amongst the trees.Follow the grassy track to the south end of the rock where there are old olive trees.Stop at the first olive tree, turn right and make for two pine trees below the southern end of the rock . The path up the rock passes between these two trees. To return to Ag.Pavlos continue on through the olives (look for the way marker)on a path leading to the northwest . On entering the wood the path soon traverses to the left, around a small hill, and a fine panoramic view is seen of the coast and Kelyfor Island.The route continues to descend to the northwest through the pine trees, passing a large rock face on your right.Eventually a wire fence is reached which bounds an olive grove.Continue along the fence to the join the track serving the olive grove. This track leads directly back to Ag.Pavlos. The return route from here is identical to the route of ascent. This walk is a circular route that uses mainly forest tracks to cross over the hill behind Nikiti to visit the small town of Ag . Nikolaos (Santa Claus). The Start of the walk is beside the school in Nikiti. When coming from the north turn left at the traffic lights and find a parking place along the roadside. The school is on the left side of this road not far from the lights. The start is on the school on the left side of this road not far from the traffic lights. Walk from here northwards up the street, past a pharmacy to crossroads. Here there is a sign to the Old Village pointing straight ahead. Continue on in the same direction to reach a road junction. Bear left here as the road narrows and continues to gain height, passing through the older quarter of Nikiti. Eventually the road becomes paved and quite steep as it climbs up past the fine church and the graveyard. At the crossroads beyond the church carry straight on up the hill on the unmade road. As one climbs it is worth looking back occasionally for a view over the village. The road climbs up through trees and more open ground to reach the ridge in a further 500m or so. Turn left along the ridge track that climbs to the north, eventually passing a goat shelter in a field on the right. The route now enters an olive grove in much more open ground and continues to the north to arrive at a junction, with a concrete triangulation point over to the left. Keep straight on at the junction. The track continues north through open woodland and fields, with beehives lining parts of the route. After about 5OOm of walking a junction is reached with a road to the right, signposted Agios Nicolaos. Follow this track as it sweeps round to the east giving fine sea and mountain views ahead. To the right is a deep valley, which is contained by the ridge that we have walked round. Three hundred metres from the junction a small church is reached; perched on the top of the ridge with a fine view of the valley below. Here there are also picnic tables if a rest stop is in mind. Leaving the church the track crosses a small plateau and then begins to descend quite steeply towards olive groves ahead. From here our goal, the village of Agios. Nikolaos, can be seen over to the right, as the descent continues, on a shady woodland track, to emerge at more olive groves on both sides of the path. Eventually the track levels out at a junction where there are beehives and a small blue Eklissaki. Turn right at the junction to arrive at a spring and water trough, fed from the hillside behind. The track now continues in a southerly direction towards the ridge ahead, before swinging left and climbing up to the outskirts of the village, which can be seen on the left. The return route to Nikiti Starts at this corner. If you are not going into Agios Nikolaos look for a way marker sign to the right just on the bend of the road. This takes you into and across the mature olive grove, with a chicken hut on the left. Follow the rough chalk track past the buildings and round to the left. A narrow track now climbs up the slope to the left to meet another track. This now contours south, following the ridge above you to climb up into the wood. The reason for the lack of trees in this small valley is that it was the scene of a bad forest fire a few years ago and the Vegetation has yet to fully recover. A large tortoise shell, bleached white, was lying near the track when l passed, possibly a victim of the fire. On entering the wood and climbing to a flat grassy area the way ahead is blocked by dense Vegetation. Here the path swings round through almost 180 degrees to climb out of the valley. 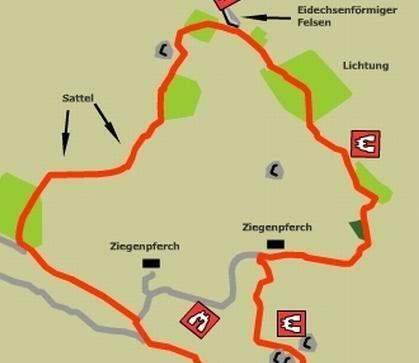 The track climbs east for 120m or so, then swings west to climb up to ploughed fields on the plateau above. Depending on the season there may be crops in the ground, so follow the north eastern edge of the field round to meet a farm access track leading due west. In 100m this track joins another good sandy track leading south to arrive at another junction 100m on. Turn right here, following the track, to arrive back at the track junction with the concrete triangulation post nearby. From here retrace your steps to Nikiti. Strenuous direct ascent, including the visit to an old watermill. The walk Starts on the Neos Marmaras bypass directly opposite the southern access road into the village, the Porto Carras end. 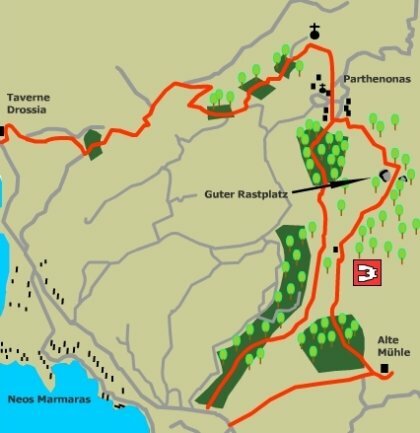 At the start, look for the way marker marking a farm access track directly opposite the southern access to Neos Marmaras. This track descends from the road and continues in a northeasterly direction, for 600m or so, to arrive at a farm, with cattle and pigs. Further on beehives are passed. About here we leave the farm track, joining a smaller path to the right, which continues, towards the head of the valley. Soon a streambed is crossed, and then crossed again, as the route bears round towards the south. The path now follows the left bank of the stream for 200m, to arrive at an abandoned mill. Although it only dates back to the 1920's this building is worth investigating. A path to the left of the building leads up and behind it to a large water storage tank. A 160m long stone aqueduct, which can be followed up the valley to the dam and reservoir, feeds this tank. To continue to Parthenonas we retrace our steps from the mill for 60m. Here turn right, at a large olive tree, onto a path, which climbs the ridge on which the olive grove stands. The route continues upwards for more than a kilometre, negotiating the stepped levels of the olive grove. As you climb take time to enjoy the view of Kelyfos Island to the rear, the fine olive groves to the left and the deep gorge that drops away to your right. Eventually the olive grove is left behind and the path passes through scrubland and. forest, meandering somewhat, but maintaining its line up the ridge. At the top of a rise, a farm is seen ahead. The path now swings due north to avoid the farm, and turns on to a farm track. This track travels northeast through open woodland and across a narrow ridge, with a gorge on both sides. As you cross the ridge look for two large stones at the left of the track. The path leaves the farm road here to continue its journey to the head of the valley. The way now passes through a small canyon, beyond which is a flat piece of ground surrounded by large rocks; a fine place for a coffee break. The next part of the route exits at the north end of the Clearing, descending to the northeast, where a flat bed of rock marks the head of the valley. The track now climbs slightly, passing under a large tree and round a large rock. Below and to the left look for a grassy forest track. Drop down onto this track, which follows the hillside round towards the northwest for a kilometre or so, to arrive at an isolated house with beehives. Soon Parthenonas can be seen ahead as the last 600m of path leads us first down and then up to the plateau on which the village Stands. Easy The start for this walk is the tavern Drossia, which is on the left as you approach Neos Marmaras from the north, about 1.5km from the village. Walk up behind the tavern onto a track, which rises to the left, through a small grove of olives, to meet another track. Join this track, which climbs up, behind the houses and passes some beehives. Keep left at the junction as the track ascends. Continue on the main track, which meanders up in a northeasterly direction; keeping to the left at the next two intersections. The terrain alternates between olive groves and mixed woodlands and is particularly beautiful in autumn. At the next junction keep left through the olive grove and continue, contouring round the side of a deep valley on the right, to arrive at the next fork. Here take the smaller track to the left and continue on through an olive grove on a broad, flat plateau of land for 200m or so, when the path begins to climb again. At the next junction follow the lower road to the right, as the road to the left is just an access road for a small church on the hillside above. From here one gets a good view across the valley to Parthenonas and one can see how its position, high in the hills, would dissuade pirates and other marauders from venturing up there. The track continues to ascend to the northeast, then turns right at the head of the valley to ford a stream and travel southeast into Parthenonas, past a row of houses. There are two taverns in Parthenonas, one at each end of the village. Just over the road from the Village Hall, near a large tree, is a small distillery that makes Tsipouro the local Greek firewater. This steep but safe descent brings one out on the Neos Marmaras road near the Start of the strenuous route, described earlier. From the southern end of Parthenonas, follow the Poseidon signs south, directly down through the olive groves to the streambed. Here a goat track is followed parallel to the streambed for about 1 km, at which point the path crosses the stream into the olive grove on the other side. 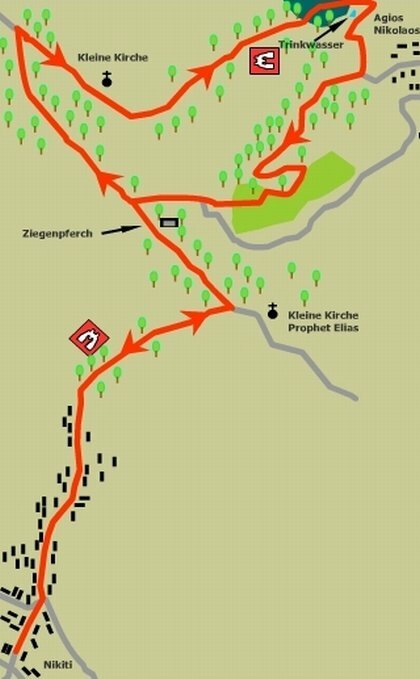 The route now descends through the olive grove to arrive at the main road only 300m north of the Start point. This walk takes one on a circular trip around the ridge directly above the town to the north, giving fine views over the town and the surrounding countryside. The route makes use of old charcoal burners paths, goat tracks and unsurfaced farm access roads. Parts of the circuit involve rather steep, but safe, rocky ascents and descents. The Sykians have a long standing tradition of independence and an unwillingness to be subdued. Park on the outskirts of the village, just before the one-way street leading to the centre. A tavern straddles the space between the access and exit roads from the village centre. From here walk along the one-way street towards the centre, with a streambed to the right. From the Plaza look for the Poseidon way marker signs, which follow the street to the northeast. At the end of the street a track continues up the hillside in a north-easterly direction, to emerge on a broad dirt road in a distance of 1 km. Cross over the road and look here for a red Poseidon sign, in spray paint, on the rock face. This marks the start of a small rocky track that rises up the cliff face to eventually reach the summit above us. Follow this track, which leads up to a circular grassy area in 120m or so. This is an old charcoal burner's workplace*. In former times this hill would be covered by woodland, which was felled to produce charcoal, leaving the scrubland, which we see today. The path leads on, climbing up and round the end of a large rocky outcrop. It then turns northwest, leading straight up the slope, as it winds its way between, and sometimes up and over, magnificent, smooth, rounded rocks. It then turns north through a narrow col to arrive at the first summit. From here there are excellent views towards the coast and of the town and countryside below. From the top of the hill, goat pens can be seen to the north in the valley below. Beyond is an encircling ridge, which is our next goal. Follow the goat tracks down the minor ridge, which leads towards the pens (the best route should be marked with red and white tape on the bushes or red paint on the rocks). In 500m a streambed is crossed and the path rises to the goat pens. Walk along the farm track, which leads due east through the pens, to reach a small promontory; looking down onto a stream below. Ahead, across the stream, are two olive trees that mark the path up the hill. Cross the stream and join the path, which climbs steeply to the east, then Swings to the west, gaining 50m or so in height, to arrive at an old olive grove. The route passes through the small grove, and then swings east towards a large rock face. Pass directly below and round to the right of the very large rock to arrive at a large field. Follow the left hand edge of the field past a large, weather carved rock to reach a second summit, at approximately 280m above sea level. This is another fine viewpoint. Now follow the good rocky track leading northwest along the ridge, which arrives at yet another high-level field in a further 400m. Cross this field, passing a large rock to your left, and climb west towards a lone tree. Continue on towards the ridge in front and, as the field is left behind, the ground drops away into the valley on your left. Continue round the head of the valley, gradually climbing in a northwesterly direction, and enjoy the fine views in all directions. As you continue a grassy ridge appears ahead and to your right. Make for this ridge to see over into the next valley. A large inclined rock, shaped like a lizard's head, with a small grassy area to the right, is seen next. Climb up to this rock for magnificent views of the sea to the east and the valley that lies beneath us. This rock at 345m is the highest point on the route. Continue west, descending to a field about 70m away, then turn left into another field 40m to the south. Here turn right, descending to the bottom of a small dip and rising up the other side. At the edge of the field continue on along the goat track to the neck of the valley, cross the stream and climb straight up the other side. Here a maze of goat tracks head south as they traverse around the corner, to the left of a very large rock, in order to access the next small field. The best track should be marked with red paint on the rocks and plastic tape on the bushes. Skirt round the top of the field to exit by a path at the top right hand corner. This leads up to a small col, which is crossed to continue southwest around the head of the valley, providing superb views to the east. The track now descends gradually for about 300m, before rising on an excellent path to the top of the next col. From here descend towards the goat pens in the valley below for 1 50m or so, when a field appears to the left. Cross the top of this field to arrive at another field containing beehives. Directly ahead, across the second field, is a dirt track, rising to the brow of the hill. Cross the field to reach the track at its highest point. The return route follows this track down to the southeast, and back towards Sykia. After 700m of descent a track joins from the left. Turn right onto this track and continue down to pass a rock, which has been sculpted by the weather to look like a human face. A further 350m of steep descent bring us to a bigger road from the right. Turn left onto this road and continue down, to reach the old track leading back down to point A on the map. From here retrace your Steps back down to the village and a welcoming tavern. *Many years ago it was a common site to see the Charcoal burners at work in the forests of Europe . Today the only evidence of this once widespread occupation are the flat circular hearths, where the fires were built, and the occasional stone built bread oven. However this ancient craft is still practised in Halkidiki. Near Taxiarhis in the Holomondas mountains l came across wood stacked ready for converting to charcoal. The fire is lit and then covering the stack with wet earth to reduce the oxygen supply slows the burning right down. While burning the fire must be watched night and day to ensure a good yield of charcoal. When the fire breaks out at any point it must be quickly sealed in again with wet earth. After several days the fire goes out and the earth cover is removed to reveal a Stack of lump wood charcoal.